Elevator, or lift? The American–English is more elegant this once! Two things prompted this writing prompt. I once read an interview with author PD James in which she mentioned a lift she’d seen with a notice beside it stating: Do Not Use on Friday Afternoons. 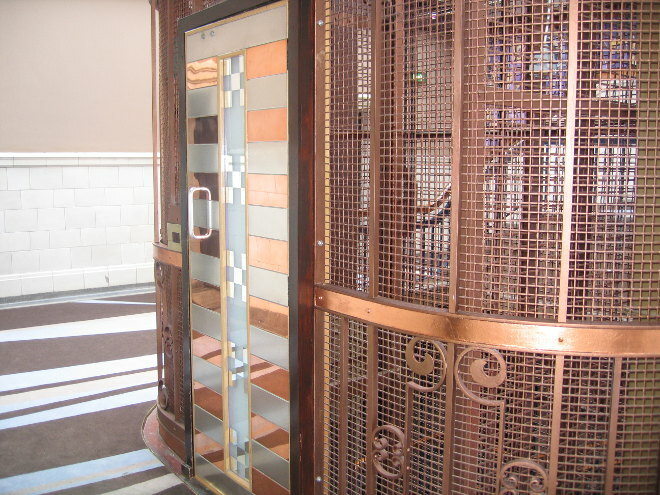 The second is that recently I was working with a magazine publisher in a very tall building (by British standards) that only had two working lifts, and then one was taken out of action be refurbished. One day after lunch, I pushed the call button, and a few moments heard the doors to my left swish open. This was the apparently out-of-action lift, twinkling and calling to me, so I stepped aboard, and whizzed up to the 11th floor where I emerged feeling rather smug. The next morning, I pushed the call button, and when the new, shiny lift arrived, I stepped in confidently, followed by four other trusting colleagues. We zoomed up a few storeys, then the lift faltered, and dropped, then came to an abrupt halt. We weren’t in there long before someone prised the doors open and we were able to climb out (we were between two floors). It was a weird fifteen minutes or so – watching people’s responses and thinking how long we might be trapped for, especially as the woman we answered when we pushed the emergency button seemed totally bewildered. Perhaps she was just walking past a desk when the phone rang! Set your story in a lift, or an elevator (your choice! ), then trap someone inside or have it send them somewhere unexpected. Alternatively, focus on the woman who took that phone call and seemed so nonplussed by our request for help. What’s her story? This entry was posted in Writing prompts and tagged creative ideas, inspiration for writers, PD James, story ideas, writing inspiration by Judy. Bookmark the permalink.